Prize: You’ll get two nights’ accommodation and roundtrip transportation, so you can be in the audience for SiriusXM’s Top Comic Finale on September 27! 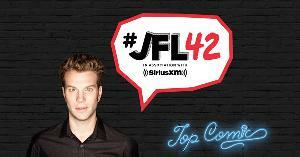 Plus, you’ll also laugh it up with Anthony Jeselnik on September 28. Requirements: Must be a SiriusXM subscriber. Statistics: This contest was opened by 101 and entered by 7 ContestChest.com members. 7% of those who opened the contest, entered it.